The 1.14 hectare site in Nuneaton, West Midlands was previously occupied by a manufacturing factory. The site comprised factory and office buildings, car parking and a number of oil and chemical storage tanks. Associated with the former storage and process areas were soils contaminated with Total Petroleum Hydrocarbon (TPH), Lead and Nickel (plate 1). Following remediation, the site was developed into a residential housing estate. The development comprised a mixture of traditional two storey houses and flats with associated residential gardens, managed landscaping and hardstanding car parking and access roads. The remediation strategy for the Nuneaton site was designed to address the on-site source contamination and indirectly, the pathway contamination issues with the intention of protecting both human health and groundwater receptors. 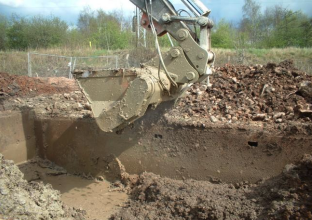 Envirotreat employed an ex-situ soil mixing remediation strategy for the treatment of over 2650m³ of contaminated soils. The works were conducted over a 4 week period under the auspices of Envirotreat’s Mobile Process Licence (MPL). Specialist technology, materials and supervision were supplied by Envirotreat, whilst DSM Group supplied all the required plant and labour for application of the Envirotreat® Process. The contaminated soils were excavated, stockpiled and treated on-site using the Envirotreat E-clay® technology. The Envirotreat treatment plant comprised slurry production units and mixing zones.